Happy Holiday T Day everyone. Tuesday has arrived once again. 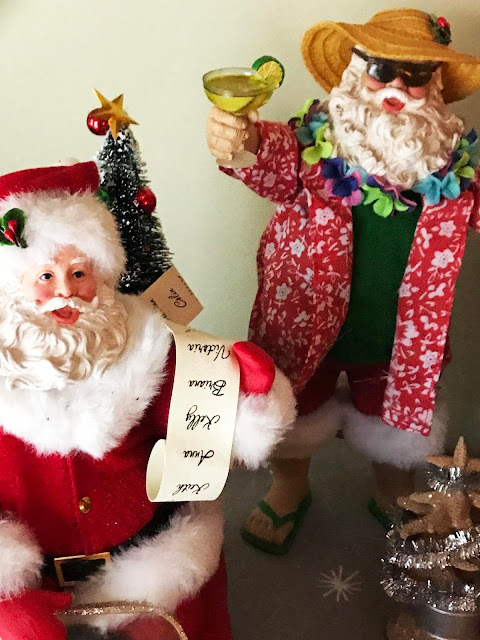 As this is the final T day before Christmas, the vacationing Santa in my photo is wishing you a toast to celebrate (or to those of you who have already been celebrating) whatever winter holiday you chose- Hanukkah, Christmas or even the upcoming Kwanzaa. And I am sure there are other holidays celebrated around the solstice also. So whatever you celebrate, cheers! And I will toast with this mug of yummy coco from my favorite hole in the wall breakfast place which I visited a few weeks ago. With real whipped cream on top of course. Be sure to stop by our lovely hostess Bleubeard and Elizabeth's blog and see what the ladies are up to this week. We also love you to join us! And I have a holiday card to share. I'll most likely be posting a couple of times before the week is out, but I know many of you will be busy. So as I write this on a snowy Monday night, sipping lemon and honey tea because I am trying to keep a head cold from turning into a holiday disaster, I wish all you lovely T ladies a Merry Christmas. First off- I love your festive header and then your equally festive post! Beautiful card from Kathy. Love the Santa cheers and that luscious mug of cocoa! Be well, happy T day and a Merry Christmas to you and yours! Your head cold doesn't sound good. I hope it doesn't turn into something worse. I simply adore your little vacationing Santa. He's adorable. I've never seen one like him before, although I know you have a Santa collection. Your hot chocolate looks wonderful. I considered drinking some earlier today, but chose coffee instead, since I needed the caffeine rush. Thanks for sharing your Santas, your cocoa, and your postcard with us for T this Tuesday. happy t-day and have a wonderful festive time! Oh yum I love hot cocoa but we have been so warm here still that I have not thought of it-cold coming in for Christmas though. One year I was just so behind on everything that I decided to make early Spring cards for everyone instead of sending out Christmas cards. I really loved your handmade card very much-and I do hope your cold does not escalate for the holidays-no fun. Funny Santas - they are gorgeous and your yummi cocoa with whipped cream looks tempting ! A lovely card from Kathy! Take good care of you and get well before Christmas my friend! Its a wonderful ornament of Santa on holiday, I hope he is ready for his marathon day that is creeping up fast. Its a lovely card you shared as well. Happy T Day and The Merriest of Christmas to you and your family!!! 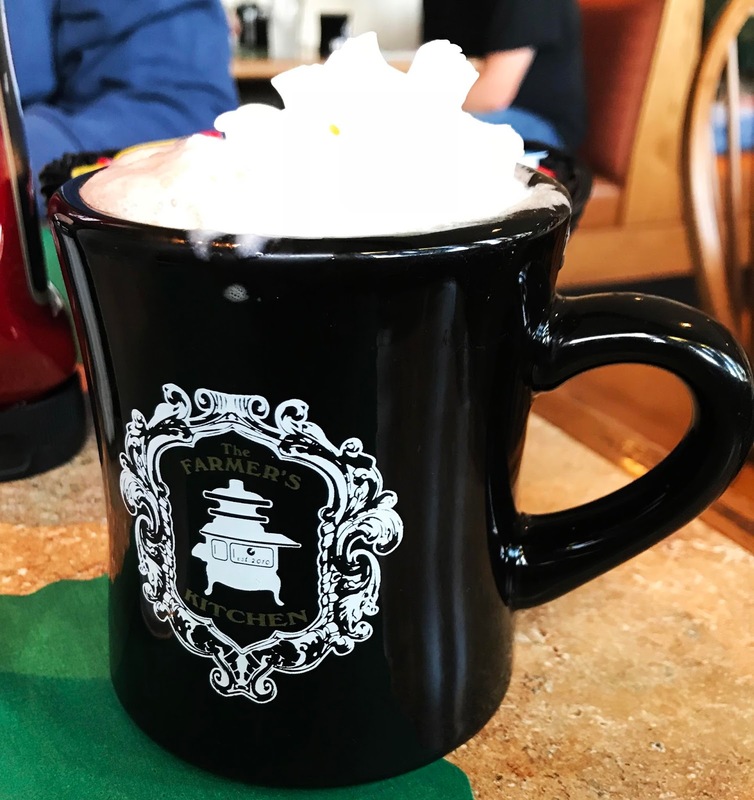 Your hot cocoa looks super delicious with the whipped cream as a crown! The hot chocolate looks great with that mound of real whipped cream, but I'm with vacation Santa. Is it July, yet? =^,.^= Sorry you're feeling under the weather. Hope the lemon and honey tea work. Feel better! Oh Erika! I love your Santas! They are so darned happy, I smiled when that first photo came up! And Kathy's card is wonderful! Merry and Happy. Your vacation is nearly here! Erika you have me drooling over that mug of cocoa and whipped cream... I've not had one yet this year and i think that needs to be remedied very soon..
Love your tropical Santa, Erika. I can't tell the scale in your photo. At first I thought it was a real person dressed up as Santa - lol. Pretty postcard from Kathy. I hope you'll able to knock that cold out of your system before the big day. 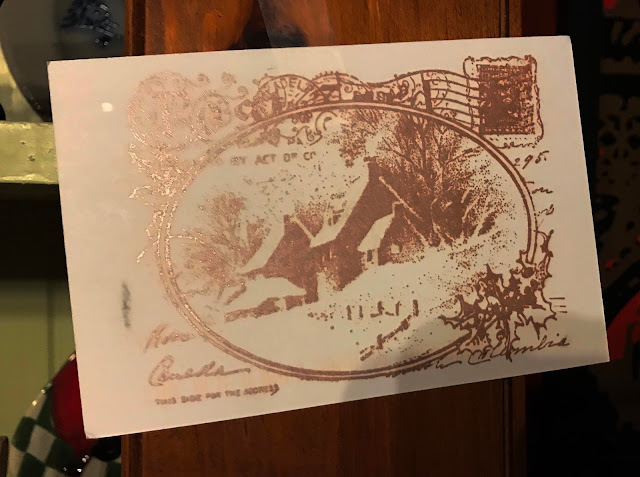 I love that gorgeous vintage cottage image - a charming card. And I'm glad to see that glasses (and mugs) are already being raised round your way!